DMI polar data shows cooler Arctic temperature since 1958 | Watts Up With That? From DMI (Danish Meteorological Institute) we learn, that Arctic 80N-90N temperatures in the melt season this year is colder than average. This was the case last year too, while earlier years in the DMI analysis period (1958-2010) hardly ever shows Arctic melt season temperatures this cold. It seems that average Arctic temperatures 80N – 90N in melt season of the years 2004, 2009 and 2010 are around 0,4-0,5K whereas the temperatures in 1991 and 1993 where around 1,3 K. In general DMI´s data (if correct) reveals a cooling from the mid 1990´ies till today. The 80N-90N area of the Arctic is practically always ice covered. Therefore, the 80N-90N is perhaps not so affected by heat from the other areas of the Arctic that has been still more ice free in the period 1995-2007. Im not sure why DMI shows such a cooling trend for the 80N-90N area, but it could appear as if the ice covered areas of the Arctic has its own history of temperatures? And how should GISS data from distant land stations account for this? The Arctic melt season is mostly June and July. For both months the GISS Arctic temperature trend 1991 vs 2009 shows warming around 0,3-0,7K which is in contrast with the DMI trends of cooling of around 0,7K for the region. You want to know the Air temperature in 2 meters altitude. Which temperature would be most precise, the water temperature around the boat or the temperature from land ( measured at the city airport… ) ? Now imagine the same situation, but this time you are 1150 km from land. Which temperature would you rely most on, the water temperature around the boat or the temperature from land (city/Airport) 1150 km away? Since 1987, James Hasen, and thus GISS, har used a 1200 km radius in their global temperatures based on meteorological stations and thus extended land temperatures to cover a considerable ocean area. Below a compare of SST with the temperatures GISS use for ocean areas. 1) Left: GISS land temperatures including land temperatures to cover ocean areas. 2) Right: As 1) but now for the ocean areas the actual SST measured by the Hadley centre are shown. Both pictures are from july 2010. From this illustration we see, that ocean areas represented by SST are poorly reflected by GISS land temperature data and the idea of expanding land temperatures to cover ocean area appears challenged? August 5, 2010 in Arctic, Climate data. If you plot a trend from 1958, you get a steep decline. Shouldn’t all temperatures be denominated in C instead of K? Photographs of the ice correlate very well with DMI temperatures. There has been almost no melting at the pole during the last two cold summers. 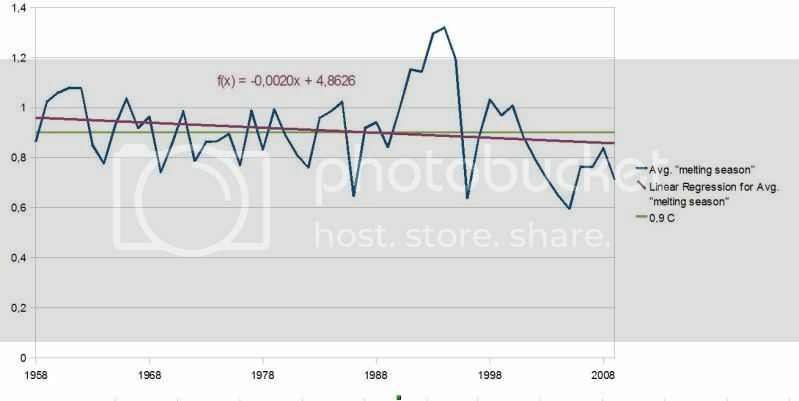 This temperature decline since 1990 can’t be right, because CO2 has increased dramatically since then and the IPCC says we will see the first evidence of CAGW at the poles??? Wouldn’t the warm ocean currents coming from the south have more impact on the arctic ice melting than the surrounding air? Doesnt this aggrevate the CAGW crowd a bit? Sounds like real science. The truth is in the details and they are messy as all get out. Researchers discover irrefutable proof that Arctic Sea Ice had disappeared in the mid 1800’s, at the end of the Little Ice Age. A minor point of clarification. DMI don’t produce this data. The data comes from the initial conditions of the ECMWF weather forecast model after assimilation of observational data. DMI plotted the graph, but weren’t involved in the production of the data. “2) Right: As 1) but now for the ocean areas the actual SST measured by the Hadley centre are shown. If they’re both from July 2010, then they’re not Hadley Centre SST data. From December 1981 to present, GISS has used Reynolds OI.v2 SST data, which is an NCDC product. Looks like the hockey stick is pointing down. Frank Lansner: Oops. I saw the Arctic reference and assumed the post was written by Steven, sorry. I’ll then redirect my comment to you. You wrote, “2) Right: As 1) but now for the ocean areas the actual SST measured by the Hadley centre are shown. Wrong! If they’re both from July 2010, then they’re not Hadley Centre SST data. From December 1981 to present, GISS has used Reynolds OI.v2 SST data, which is an NCDC product. Also, please provide a link to the ERA-40 data you used to create the graph. Does James Hansen have the satelite readings from 1958 to 1980 to refute this? Well , on checking the north pole web cam , which I have been assured by a member of the camera crew is correct , it is showing the cameras temperature is 11 centigrade , quite toasty for the north pole , my back yard in England is presently the same temperature – hope we do not mirror the north pole temperatures as we go into winter !!!!! Steven Goddard: Please disregard my earlier (August 5, 2010 at 3:29 pm) comment. I saw the discussion of the Arctic and the use of the DMI data and assumed, incorrectly, the post was written by you. I’ve redirected the comment to Frank Lansner. First, you compared to the wrong SST dataset. GISS has used Reynolds OI.v2 for almost the last three decades. The differences you’re seeing between the GISS data over the oceans and the HADISST data may be due to the differences between Reynolds OI.v2 and the HADISST data you used incorrectly. Also, GISS includes land surface data from many islands and this may be causing some of the difference. Do you feel that the usage of NCDC or Hadley data would have any impact on Frank’s conclusions? Try yourself, first witth empty ocean box. Then with the Had/reyn in the ocean box. The differences i show are the differences GISS shows themselves. I just focus on the areas where both SST and GISS land temperatures for oceans are available to make it easier to see how huge the differences are. And yes im aware that GISS has some of their stations on Islands, but non the less, the differences GISS show between their land projections and the SST they use appear considerable. The last temperature recorded was 1.9 C.
And even though you think the GISS meteorological index from GISS in only for “sentimental” reasons, these data are still on the net for the public to see and use, and thus should be correct. Bob, DMI does not only use ERA-40, they use to other sources/methods too, so i did the slave-work: I have magnified all DMI-maps to pixel size and counted pixel for pixel, so it took weeks. Go to the DMI site and you will fast conclude that im just telling you what these data actually says quite clearly. Well done. It is a unfortunate that some official sites release graphs without the digital data which they were plotted from. Yes. Regarding his Figure 6, there are differences between the HADISST and OI.v2 SST datasets. But there is basically no difference between the GISS12o0km radius smoothing and the source Reynolds OI.v2. Refer to the following comparison. I used that area of the South Pacific because GISS doesn’t have any island surface station data in the region to skew the results. The Reynolds OI.v2 data is a noisier SST dataset than the HADISST. And the GISS data (1200km radius smoothing) for that area is slightly less noisy than the source Reynolds OI.v2 data. If Frank is going to write a post complaining about GISTEMP, he should at least understand what SST data they use. Nice link. The current DMI 80N reading is generous, being that the webcam is at 85N. Oops. Missed the minus sign. (weird column structure) My point was that the 11 degrees seen in the webcam image is likely the internal temperature of the camera. Oh no, its worse than we thought. clearly shows the temperature is declining from 1992 to the current data. And if I do my eyeball of that trend within 20 years, the temp in melt season may be 0C or lower. It appears that the decrease in temperatures at the artic region should probably be increasing the volume, well slowing the rate of decrease of volume at the artic. Now that the PDO is into its cold phase, and that the AMO should be reversing in the near future the artic sea ice extent and volume should increase a large amount in the coming years, and if the artic temps continue on this trend, there should be very little summer melt from now on. But GISS does not represent that the dTs data where it extends out over the oceans is SST data or that it would resemble SST data. They should have considerable differences. They are different data, illustrating different things. But you have not shown that it is incorrect. In the areas where the dTs data extends out over the oceans, do you have any proof that is not extrapolated and interpolated correctly from the land surface data? As I wrote above, GISS is not representing that will equal SST data. You assume the two should be equal and that is your error. Frank’s post is about the discrepancy between DMI and GISS. Regardless of which of the two data sets the GISS site allows you to choose from (Hadley or NOAA) you get the same answer. So, I would suggest that you take your complaint to GISS for claiming to use a data set which you think they don’t use. Actually, Frank’s shifts to another subject. I have no compaint. Unlike some others, I understand what datasets they use on the mapmaking page, because they state what data is used. And I also understand which of the two is the official dataset. Their official SST dataset is made up of HADISST from Jan 1880 to Nov 1981 and Reynolds OI.v2 SST data from December 1981 to present. And in Hansen et al (2010) they also confirm their official SST dataset. Refer to page 26. They write, “The standard GISS global analysis uses the concatenated HadISST1+OISST data set, as described in the main text. Any of the alternative ocean data sets described here would yield slightly greater global warming, both in recent decades and on the century time scale. The link you provided is to a map, not to a post you wrote about GISS using Arctic land surface data out over the oceans. …And if I do my eyeball of that trend within 20 years, the temp in melt season may be 0C or lower. It even worster than we thought! Was it the leprechaun who lives inside the camera that told you that? The coast is an important/significant meteorological boundary and ignoring that in the global temperature picture surely gives an incorrect overall reading. I am way outside my comfort zone here but I think I see what Frank is driving at. Glad to see this post. I think it’s important for showing what is really happening with Arctic temperatures for a contrast to what GISS is showing. Although Bob Tisdale has made many valid criticisms of Frank’s procedures, I think the central theme of his post still bears careful consideration, as Steven Goddard pointed out. Certainly GISS does not cover over the SST data with land data in their final product, but they do more or less that very thing in the artic. With little station data, they use Hansen’s 1200km smoothing (a peer-reviewed method)to ‘fill in’ the artic with a trend that diverges from that of DMI . Now who is right? I don’t know; but they can’t both be right. Anyways, Willis Eschenbach posted a while back dismantiling the 1200km correlation thesis (IMHO). Ed Caryl – thanks for the link showing the cooling at the north pole. Wow that looks cold to me for August! Researchers discover irrefutable proof that Arctic Sea Ice had disappeared in the mid 1800′s, at the end of the Little Ice Age. Irrefutable? What’s your definition of irrefutable. Then again, whatever it is, it will be ‘irrefutable’. Try not to generalize. Bob recently made a long nice illustrated article showing some consistensy between NCDC, CRU and GISS land data, because he thought that I was attacking the GISS land data when I was not. I was attacking the weighting of GISS land data. So the whole point of the article was hard to find for me and it really confused me a long time. – But I did make a dumb mistake thatBob then eventually pointed out in the comments. But Michael, please go through my site: http://www.hidethedecline.eu and see if “franks procedures” generally have a problem before you just write like this. Bob: I think its good that you want the sceptic forums to be of highest possible quality, but i cant help wondering why I dont see any excitement in your writings of the central element in my findings? Honestly dont you find it interesting that DMI actualy shows a cooling 80N-90N ?? Why not one word of enthusiasm? In april (i think) I made a story about La Nina “shark” at joanne Novas site indicating that La Nina would come soon, and PANG the day after you wrote a whole article that nobody should take notice of this “fuss” that one should not expect La Nina. But what happened… ? So we can all make mistakes, we should just help each other in a good way, motivate each rather than the opposite. Frank Lansner: Oops. I saw the Arctic reference and assumed the post was written by Steven, sorry. It would help if thread-author’s names were made more prominent, by being for instance boldfaced, enlarged, and/or centered. …GISS maintains it for sentimental reasons. Personally, I wish it didn’t exist, because it adds confusion. Agreed. Extending that land surface data out over the oceans provides a significant bias. But Frank’s post shifts out of the Arctic, possibly to illustrate the bias created by the land surface data. But in his discussion of it, he has identified the SST dataset incorrectly. In June 2010, GISS does not use Hadley Centre data. If Frank had written “Hadley/Reynolds” I probably would not have commented about his post. Just to clarify, it’s really not a “more or less” thing. They purposely delete SST data for much of the Arctic so they can replace it with land surface data, which has risen at a higher rate. Please keep in mind that GISS doesn’t pretend that land temperature is equal to sea temperature 1200km far. GISS deals with temperature anomalies. What GISS says is, no matter what the true temperatures at the airport and at the sea are, if the airport temperature is 0,5K higher than normal for the airport, the temperature at the sea will probably be 0,5K higher than normal for that place at the sea. Not that I think that this is a valid assumption, but it is definitely not the same as in the “what’s the temperature in my boat?” example provided. Its true, its a typo, it should have been “Hadley/Reynolds” as this is the data I show and use. Look at the DMI graphs: you’ll see that ‘warmer’ temperatures are at the coldest times, but ‘summers’ are cooler. Not particularly. The majority of the DMI data is from the ECMWF ERA40 computer model reanalysis, and if you’re not aware of it, ERA40 has a higher monthly Arctic surface temperature trend (80N-90N) from 1958 to 2002 than GISTEMP. You wrote, “In april (i think) I made a story about La Nina ‘shark’ at joanne Novas site indicating that La Nina would come soon, and PANG the day after you wrote a whole article that nobody should take notice of this ‘fuss’ that one should not expect La Nina. But what happened… ? So don’t think my posts are written to prove that yours are wrong. the only graph I look at is the 30% extent one. That is going up and up rather than down at the moment, pointing to higher concentrations further into the arctic circle. If the 15% extent (ie around the edges) is diminishing but the 30% is increasing, it points to ice being pushed inwards rather than melting I would have thought? Sorry if the comment you’re referring to did not include the word anomaly. My mistake. Also, the land surface station data (GHCN) used by GISS does not all come from airports. Yes, we talk anomalies, but what i showed was that anomalies from land does not match anomalies at sea well. So the whole discussion is indeed based on anomalies already. Bob, I too have considered that ERA-40 data ends in 2002 and this might be part of the explanation. Fact is, DMI today shows Arctic temperatures in melt season around 0,5 K and they show higher temperatures for earlier years like i illustrated. So if this is not interesting, then you are saying that DMI is presenting data wrongly? DMI did not consider the shift from one dataset to the next and therefore shows colder temperatures today for the Arctic? Evidently the leprachauns name is Nancy , so its a Lady Leprrachaun ! Here is the question I asked below , and Nancys answer . On the north pole web cam there is an internal temperature display on screen , today it was 10 degrees centigrade . Is this the temperature inside a fixture that houses the camera and is it artificially heated , or is it the actual temperature at the north pole , it is very confusing and I am suprised there seems to be no information about it . Thanks Anthony. Temperature, Pressure, etc. : The temperature and other environmental measurements you see in the left corner of the picture are correct. 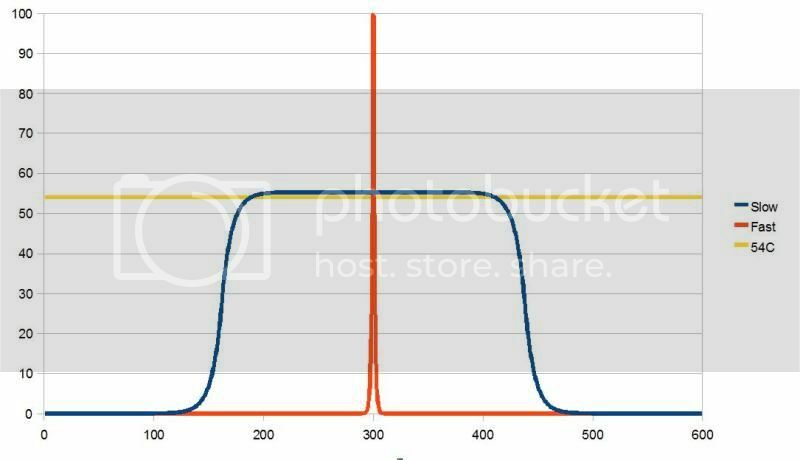 The temperature shown on the image is the temperature of the camera, and may be warmer than the surrounding air temperature (think about how your car heats up on a sunny day). Because it is spring, the temperatures are warmer than they are in the middle of winter, when the temperatures are near -30 deg C. Also the ocean water below the ice floes is near the freezing point for salt water (-1.7 deg C), so this helps keep the temperatures higher than they would be on land. Scientific measurements of temperature and other environmental parameters are found under “Weather Data” for each deployment year, under the photos on the Web Cam home page. This discussion is a storm in a tea cup. It is a graph averaging above zero temperatures taken from DMI graphs. I’m not sure how these averages were derived, from real data or guestimates from the graphs. Whichever way, to me it seem quite irrelevant, because all it shows is surface temperatures above ice ranging between 1.25C and .04C. I’d consider that normal. Apparently it did not prevent the large melt in 2007 or the general decline. This is well within the -0.5C to +0.5C range you considered as ‘normal’ in the SST map colour scheme thread. The latest image from http://www.iup.uni-bremen.de:8084/amsr/arctic_AMSRE_nic.png up to 55N looks like an assaulting army stalking 80N to 90N. Quick question: won’t the latent heat of melting ice tend to pull down the air temperatures? Can someone explain why the buoys shown on the NPEO’s Bouy Drift Track Map took a a 90 degree turn recently after drifting almost in a straight line for months? Heck with that. We don’t even know that expanding land temperatures to cover the LAND area is right. There was very little melt in 2007 north of 80N. Your assumption is incorrect. Question: Why is Chef “cook the temperature books” Hansen using estimates of Arctic temperatures due to closing of GHCN stations, when DMI has actual measurements going back to 1958? Answer: What’s the use? If you add wine to sewage, you still end up with sewage. No. You are reading too much into what I wrote. My interests are SST, OHC, ENSO, and things of that nature. And occassionally I’ll write about other topics like the differences between the Hadley, GISS, and NCDC data. I’m not necessarily interested in sea ice or the Arctic, but you are. We have different interests. The only reason I commented this thread was because of the reference to the wrong SST dataset in the post. For the AGW crowd these Arctic temperatures appears rather important… Ask the AGW why Arctic temperatures are so important. The temperatures does however give the impression, that the ice retreat has indeed been strongly influenced by the special winds that occurred mostly in the period 2000 – 2007. It’s good to see this DMI trend plotted: The data flatly contradicts completely Hansen’s mythical +4 degree Arctic temperature “rise” over the past few years. True: DMI is a compiled database: It’s all one set of completely independent temperature records since 1958. But now, with this long-term data set proving that summer (melt season) temperatures at latitude 80North not only NOT rising as CO2 levels rose since 1958 – but actually falling over the same period – we have another nail falsifying the Hansen’s CAGW theory. What is needed is the standard deviation of this same temperature record: That too will show how closely linked – how little “error” and randomness is in the summer temperatures ion the Arctic. However …. This is the “summer” (melt season data trend. DMI Winter Arctic at 80 North temperatures may – or may not – have risen since 1958 but very clearly have a much, much greater randomness. +/- 10 to 15 degrees jumps are common (possibly some (all ? – No, probably not!) are caused by missing “M” metadata “minus zero” numbers on the manual transcription records. The temperature listed on the image IS the internal temperature of the camera. The temperature at Camera #2 seems to run slightly warmer than #1 by perhaps 0.5 degrees C, even though it’s 100 miles further north. Actually, they are not similar. HADISST uses in situ measurements (ships and buoys)from 1870 to 1981. Due to the sparseness of SST measurements much of the data is interpolated. From 1982 to present, HADISST also includes satellite-based SST measurements, reducing the need to interpolate. On the other hand, the Reynolds OI.v2 SST data is only available in the satellite era, from Nov 1981 to present. It also uses in situ and satellite data, which would make some think the Reynolds OI.v2 and HADISST datasets should be similar during the satellite era. But they are not similar. The following is a graph of SST anomalies for an area of the South Pacific. Note how the variability of the Reynolds OI.v2 data is much greater than that of the HADISST data. The Reynolds OI.v2 data also has a significantly higher trend than the HADISST data on a global basis. Arctic temperatures are important, but in the context of this thread, I’ll point out that (1) the 2010 melt season is not yet over so the claim about 2010 is pre-mature. If you look back at 2009, you’ll see that the temperature at the beginning of the melt season stayed closer to the melt point and then rose. In calculationg the average melt season temperature was it based on a fixed number of melt days, or the actual number of days? What is considered the start of the melt season? Is it the first rise above the melt point, or the second point if it drops below again for a few days. Identical argument for the end point of the melt season. Have you looked at the other end of the graph? Just look at say day 0-150 and 250-360. In 1958 this showed variation between 233K (-40C) and 253K (-20C) compare with say 2009 242K (-31C) and 259K (-14C). Look at the other end; days 250-360. From 2000 to 2009 nearly all temperatures are above average. Take 1958 to 1967 and only 50% or less of the temperatures are below average. Steve’s graph remains deceptive trying to make an issue where there isn’t. Temperature measurements withing 80N and 90N will vary with cloud cover, snow on ice and age of ice exposed. When I express concerns about .5C temperature rise it relates to sea and land temperatures over the longer term. To raise sea temperature by that much requires gigantic amounts of energy. From the DMI graphs I conclude that the melt season temperature is relatively stable (for now) but that the freezing season temperature average has risen a lot, meaning 6-9C. The impression is created of talking about the arctic in general on the premise of small temperature changes in an area of continuous ice, where temperature fluctuations are limited to begin with. It remains a storm in a tea cup. That depends on what melt we’re talking about, extent or volume. Frankly I would not expect a lot of change (extent) at 80N and 90N, it is after all at the melt centre, be it fighting a losing battle. Ice will melt in-situ and from the edges or driven out or any combination thereof. I think that the DMI graphs you used have opened a pandora’s box, the important part is what is happening during the freezing season. its true the melt season is not over yet. That why I put a conservative estimate for 2010 at 0,5K. Everthing points to something nearer 0,4K perhaps even an all time record low for 2010. But my graph shows a trend 1991 – 2010 that most certainly is not prematurely illustrated. So, I had to add a consevative value for 2010 as 10-12 days where missing, and so everything points to that i have underestimated this years cold in the Arctic 80N-90N – i will update in weeks time. Already by now my consevative value of 0,5K is too high. Fuzzy, I agree with you a little about opening this data could be a pandoras box. But reality is: These data actually seems to be part of reality – dont you agree? These data contributes to a more nuanced picture of the Arcit temperatures, and I think what we need is a more nuanced picture. For instance the GISS temperatures just claims that the area is warming massively – when its not. Is that optimal for a scientific thinking person simply to have wrong information? The pandora´s box it would be if everybody now said: “the Arctic has been cooling since 1991” – I guess thats what you fear? I think its relevant to know, that the ice covered areas up there at least seems not to have warmed – and this could support that the ice loss is due to winds and currents rather than only melting. Also – when GISS make their temperature maps, i do think that they should be as precise as possible – why else make them? Why do we want a dark red area for temperatures in an area that should perhaps be light blue etc.? RE: Query by RACookPE1978 about temp trends outside melt season. 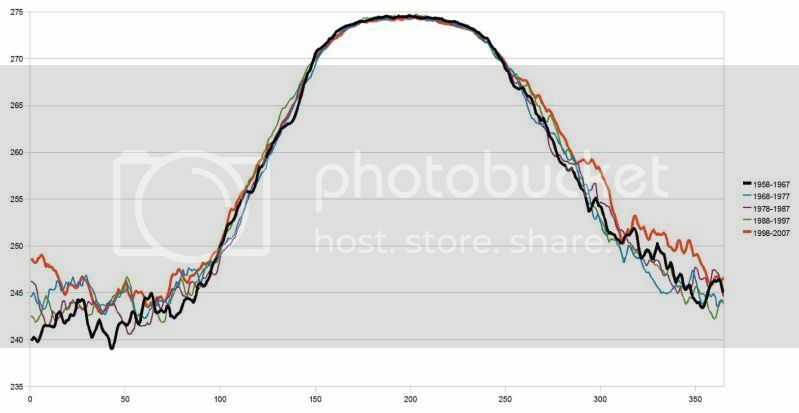 Tom Moriarty at Climate Sanity produced a highly commendable “reverse engineered” version of the temperature trend graphs that appear on the DMI site. In this article, he describes in some detail the extraction technique employed. As a newcomer to WUWT, I do not have first hand information, but, from what I can glean from the article, it appears that an animation of the DMI figures has already been posted on this site. Whilst such animations can undoubtedly be very illuminating, they are not necessarily the optimum technique when faced with noisy data. My approach to the analysis was therefore somewhat more traditional. As noisy daily data spread over a period of 52 years is a little difficult to interpret, I simplified things by aggregating the data into units we are all familiar with – calendar months. Linear regression on the ensuing 12 x 52 dataset gave the following decadal trends… Jan +0.76C/decade, Feb +0.71C, Mar +0.24C, Apr +0.31C, May +0.18C, Jun -0.08C, Jul -0.03C, Aug -0.07C, Sep +0.28C, Oct +0.68C, Nov +0.53C, Dec +0.63C/decade. The daily mean temperatures shown on the DMI site are derived from the ERA 40 product, and this uses a 45 year baseline extending from 1958 – 2002. As the summer (Jun – Aug) trends are negative, it is hardly surprising that the current temperature anomalies are mirroring this behaviour. When I look at the graphs of these 5 data series, my interpretation is that it looks like a multi-decadal oscillation superimposed upon a pronounced warming trend. (Except, of course, for summer.) Obviously many people will disagree. Alternative interpretations could certainly involve very long term oscillations, Little Ice Age Rebound hypothesis (shame about the acronym) or simple disputation of the original data. As I may well have made some stupid mistake whilst number crunching, perhaps someone on this site might care to repeat my reanalysis and post their findings, including, if possible, the graphical representation of the monthly, seasonal and annual trends. 1) What is the special significance of daily average temperatures above 0 degrees C? Sea ice melts at -1.8C, and melting would presumably begin when this temperature is exceeded at some part of the day (while daily averages are still below -1.8C). The only effect of this limit seems to be to restrict the analysis to approx 1/6 of the total data without any basis in nature I can immediately think of. 2) What was the exact methodology used to produce the graphed values? It’s all good and proper to blast climate scientists for “hiding their data and methods”, but here we get absolutely zero on the methodology used, apart from the somewhat spurious 0C limitation. Looks like a pretty crude case of cherry picking. The warming trend in the remaining 5/6th of the data left out is quite strong, when you look into it. PN – (why anonymous?) – I showed that high quality data, perhaps the best available, shows a cooling trend 1991 and foreward till today in for the melting season in the area 80N-90N. This is a piece of inforation in the scientific puzzle and then its up to you and everybody else to interpret and use this information. If you think this is an irrelevant piece of information, fine with me – I dont. Method: its described earlier in the comments – i think i will add it to the article. Then you say that the rest of the period (outside the melt season) shows something quite different. PN, please show me the trend for the non-melt season that you refer too – can you provide a link? Anyway, I think its very interesting that melting season temperatures in the ice covered area have been cooling in the same time that other Arctic areas have been melting more and more until 2007. 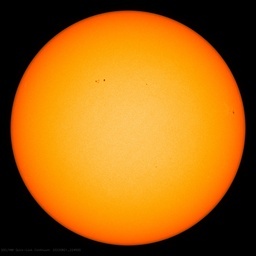 This supports that this “melting” perhaps is not just a melting but rather the results of the unusual winds and currents in the period 2000-2007 just as NASA them selves declared in october 2007. And honestly, GISS temperature data maps of glowing red Arctic 80N-90N should not allways be that red for the Arcitic – but thats irrelevant too i suppose. Given an unbiased, “uncorrupted (er, un-corrected) daily Arctic temperature record at 80 deg Latitude spanning every day from 1958 through 2010, there are two temperature trends of interest: Average summer temperature and average winter temperature. The spring and fall merely “connect” the two extremes, and display absolutely interesting data. Certainly, one could choose -1.9 degrees as a cutoff, but the meaning and conclusion of the data is not changed: Average Arctic summer temperatures at 80 deg north have fallen consistenly and steadily since 1958 while CO2 levels have steadily increased. Therefore, Hansen theories of catastrophic Mann-made global warming are false. Daily “Winter” temperatures over the same period have increased slightly over the same period, but do NOT confirm CAGW theory, because NO PART of Hansen/IPCC/Gore’s theory allows for ANY decrease in Arctic temperatures at all during any period of the year. Further, Hansen’s much-corrupted/distorted and mannipulated claims of extreme Arctic heating are also disproven mby this data: He CANNOT claim a 4 degree Arctic rise since 1970 if actual temperatures have fallen steadily since 1958, and if regional 80 deg Arctic temperatures have only increased slightly over the whole period. Thus, Hansen’s projection of 1200 km land temperature trends out over the arctic sea based on his 56% correlation in a single 1987 paper are also proven wrong. You complain of limting the trend check to 1/6 of the year, but actually, we are looking here at a widely varying (high standard deviation) low period greatly below the freezing point of water through the winter (one long flat part) and a second, slightly shorter period when the air temperature is above freezing: also along a flat, almost linear period of the curve. So your complaint is incorrect: We ARE looking at both sides of a sinusoidal record (maximum and minimum points each year) and both sections of the curves (maximum and minimum) are roughly the same length. So we are looking not at 1/6 of the data, but at ALL of the data that can be analyzed. Once a consistent, 60 year trend in the maximum (and minimum!) points in the sinusoid is established, the “trend” in the fall and spring is meaningless. You however, would appear to prefer that we use an annual “average” value so the winter rise “hides the decline” in summer temperatures. Hansen / GISS claims that globally the largest increase in temperatures happens in the Arctic – so the DMI data are thus showing that GISS data are rather useless as they use land temperatures for Arctic Ocean temperatures. The DMI data are in fact mentioned in the above article. As you can see, the graph tracks yours quite closely with the same “dips” and “rises”. However, it does not show such a strong downward trend towards the end as yours. I was unable to find the exact method you used, I fear, so can’t draw any real conclusions about this difference. As you can see, I also calculated the best linear fit to the data I had available and it shows a very marginal cooling for the so called “melting season”, only 0,1K over 50 years. This is likely not a strong enough trend to be statistically significant. Clearly, the “fast” curve would end up producing a far higher average daily temperature above the 54C cutoffline compared to the “slow” curve. The picture clearly shows the weakness of the method you have chosen. If we maintain the temperature of our sample above the ambient (0C) temperature in my synthetic example, we very clearly expend a lot more energy than if we bring the sample to a brief, high, temperature. So, unlike the poster above maintains, the full curve is what matters and the “slopes” aren’t simply lines that connect the dots. The total energy of the system is determined by the full area under the curve and not by some semi-arbitrarily chosen segment of it. Now, let as have a look at the data provided by Moriarty to display this in practice. I chose a simple method, calculating the average half daily temperature over 5 10 year bins for each half day in Moriarty’s data. (Sum temperatures for day 0.5 over 1958-1967, divide by 10. Repeat for all days as well as for 1968-1977 etc). I’m not an expert in the fields of meteorology or polar research so the choice of 10 year bins is simply based on; the data set is approx. 50 years long and it is hard to try and understand a graph with too many curves, so a limit of 5 X 10 years seemed logical. Plotting all the 50+ yearly graphs on top of each other would just have been confusing so some sort of binning seemed to be in order. The result should be illustrative, though it certainly lacks scientific power of proof. Even though my method is a bit crude, it goes to show how minute the changes are in the summertime over the 1958-2007 period and how noticeable the warming in the wintertime is. 1) As I stated before, you have not chosen the correct melting/freezing point for saline sea water which is -1.8C and not 0C. 2) The temperature data from DMI is an average over the latitudes from 80 degrees to 90 degrees. However, the melting of the ice does not take place evenly, it mainly takes place at the edges of the ice cap. If you would want a sort of an analogy, you could consider Miami and Washington DC, which are about 10 degrees apart. The actual melting would take place in “Miami”, but the average temperature between the two towns would be somewhere in “North/South Carolina” when in fact you would be much more interested in the temperature data from “Miami”. The effect of this is that the actual melting of sea ice begins at a far lower mean temperature than even #1 implies, in fact as soon as temperatures and sunlight at the edge of the ice cap allows for melting. Both of these effects means the actual melting season, if we define it as the time of he year the polar ice cap begins to shrink is quite certainly much longer than what you limited your graph to express. How much longer, I just can’t say. What is clear though, is that knowing the real length of this season would be important to draw any conclusions of the data. And that’s another important point, as my synthetic data illustration displays, the number of melting days is very important. One day at +1 C simply does not melt as much ice as, say, 50 days at +0.5 C, something you just chose to ignore in your analysis by removing the time dimension and only focusing on the temperature dimension. I’m really sorry, but nothing I have seen here so far can convince me that the analysis is to be taken seriously. There are a number of very basic flaws which any first year university student would be able to catch in your methodology and your reasoning. And the claims you make are completely beyond the scope of your analysis. Oh, and I don’t maintain a website. Not really, but I would prefer if you stopped for a moment and actually considered what implications the warmer winters have. Even though the lowest average winter temperature for the 90-80 degrees band is around -35 C the ice doesn’t keep on spreading southwards indefinitively. At some latitude, a balance is reached and the ice line stops expanding southwards. In effect, the “melting season” takes place all around the year, the mean temperature determines WHERE the ice can melt and exist as water, not WHEN ice can melt. With warmer winters this balancing point is further northwards than with colder winters. This means that as the winters warm, there will be less sea ice to melt in the “melting season” to begin with, meaning a smaller polar ice cap. The entire basis for the original hypothesis is, in other words, false. There is no specific time of the year / temperature limit when the ice suddenly begins to melt away to be followed by a freezeing later in the year (which was entirely ignored). The mean temperature correlates loosely to the latitue where the ice => water transition takes place and that is about it. Also, we should keep in mind the order of magnitude diferences we are talking about here. The cooling of the summers is on the order of magnitude of 0.1 K in the data I looked at and something like 0.3 C in the original graph above. At the same time the increase in winter temperatures is perhaps as big as 4 C. The increase in winter temperature is the dominant factor, by far. Ignoring the winter temperatures leaves the analysis and conclusions about the amount of polar ice woefully incomplete, as I have attempted to show. It is also quite silly to even begin talking about the question wheter the arctic has warmed or not if you ignore the vast majority of the year, especially in light of the order of one magnitude level difference between the changes in winter and summer temperature. Then you speak of “only 0,1K downtrend from 1958 and foreward. This is not in contrast to my findings as I dont mention quantitatively a specific trend 1958 and foreward. So how can this be showing me wrong? I just said that some recent values are colder than anything seen in the beginning. Thats why i got puzzled and checked things out. By the way, 2010 may give an all time low. I can see that the results from some of the latest years are different, and it would be nice if DMI just showed the exact numbers in stead of reading pixel for pixel as I did. But all you care about is your claimed “faults” by me ? The climate debate is truly odd. Whats that all about, Petter? Whats going on? Petter, as i wrote earlier in the comments my method was simply to booost enlargement and then count pixel for pixel. So every datapoint represents some work. So i just show DMI data year for year. I chose a simple method, calculating the average half daily temperature over 5 10 year bins for each half day in Moriarty’s data. (Sum temperatures for day 0.5 over 1958-1967, divide by 10. Repeat for all days as well as for 1968-1977 etc). As i read it, you divide readings for a 10 year period? And then you wonder why your final years does not show entirely the same decline as in my data NOT 10 year averaged? If you have divided a over 10 years, you can obviously not expect quite the same outcome. Or if I misunderstand, please explain your method again – for dummies. includes an example of how I obtain data, quite simple. UPDATE: 12/8 Estimate for 2010 now 0,395 C after DMI has updated. Coldest on record so far. It will be interesting to note that shortly (15-20 years, if the latest Arctic summer cooling trend holds) that there will actually be “no” melting season at all, and that summer Arctic temperatures will never exceed 0.0 C.
If so …. Is “that” the tipping point that slides us over into the long-overdue next Ice-Age? Yo should note that – each winter – the maximum ice extent is already met, since the entire Arctic Ocean is frozen over “from sea-to-shining-sea” as it were. Your premise that winter arctic sea ice extents are a measure of temperatures where ice addition (frezzing) “balances” between melting/ice loss and freezing is completely false. Now, please explain why measured daily arctic summer temperatures at 80 degree north are measurably and steadily cooling since 1958 – when Hansen/GISS falsely claims a +4 degree increase in recent years. UPDATE: 14/8 Estimate now 0,365 C after DMI has updated. Coldest (by far) on record so far. 3 days to go for 2010 DMI melting period average temperature.